"Hand Carved Wooden Jar from India"
This small handcarved wooden jar is from India, and shows a great deal of detail in the carving around the jar. The lid is also made of wood. 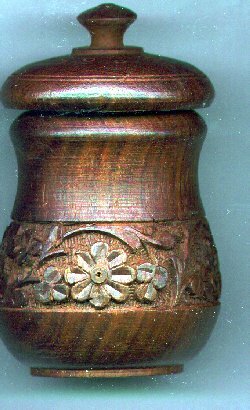 The carving is done in a flower, stem, and leaf motif. The grain of the wood is really beautiful! The jar measures 3" by 4 1/2" with lid on. The wood is finished to a smooth polish. A nice little handcarved piece. *Note* The spots shown in the scan are due to the scanner and are not on the piece itself.